Our Custom wall wraps are digitally printed on adhesive backed vinyl. By adding matte or gloss over-laminate a wall mural resists scratches. Custom wall wraps come in sizes up to 62" wide vertical panels and ceiling-to-floor in length. These are perfect for home, business, office, school and restaurants. Wraps and murals can be applied many different types of surfaces, from standard dry wall to concrete. They are easy to clean and stay durable indoors or out for years. Create a custom wall wrap from your corporate logo, personal photo, painting or other type of artwork. Submit your own custom design or choose from one of ours. 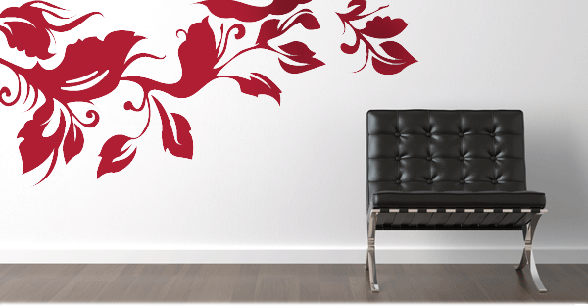 Create custom vinyl adhesive backed wall mural decals to match furniture or drapes for interior decoration. Create a wall border, design custom wall decals for a child's room, add attractive accent to home theater with a wall decal! With custom wall murals and stickers, anything is possible. A good example of a wall mural or wrap would be the construction walls at shopping malls. When a store is undergoing construction, you often see “coming soon” advertisements on the surrounding walls. This is a great way to turn you dead wall space into a prime piece of advertising. 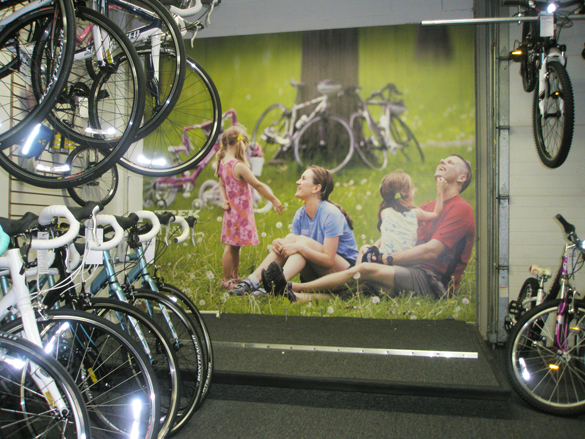 Here’s a wall wrap we installed at Kingston Cyclery. This is an example of how a vinyl cut out can add décor.